Psychology doctoral student, Andy Moss, has had the opportunity to spend a week at the University of Central Lancashire (UCLAN), with Dr John Marsh. Andy has been investigating the role of verbal processing in olfactory – or sense of smell – working memory. UCLAN possess expertise in particular piece of equipment which appears to measure sub-vocal (verbal) rehearsal. A chance meeting with an old colleague at a conference led to the connection being made, which gave Andy the opportunity to use the equipment as part of his research. Surface laryngeal electromyography (L-EMG) measures action potentials generated in the laryngeal muscles; this activation is found even when an individual is using a sub-vocal rehearsal strategy. 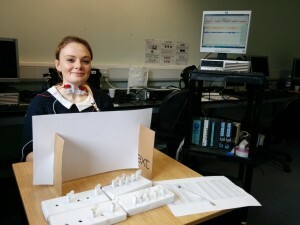 This enabled Andy to run his olfactory working memory task on UCLAN volunteers whilst measuring the extent to which they engaged in verbal rehearsal.